Get Free Haircuts for Breast Cancer Awareness at JCP. 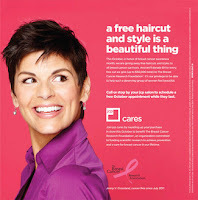 With hair loss often a traumatic side effect for breast cancer patients treated with chemotherapy, JCP salons will be offering free hair cuts and styling to breast cancer survivors throughout the month of October. Additionally, they will donate $1 for every free hair cut they give – up to $50,000 – to The Breast Cancer Research Foundation.